Fur trade sites such as Lower Fort Garry, Fort Langley, Fort Edmonton and Fort William attract several hundred thousand visitors every year—cumulatively far more people than will ever read scholarly or even popular histories of the fur trade or sit through a university seminar on Western Canadian history. In western Canada, fur trade sites are a prominent sector of the heritage industry. They help define the image of western Canada, which is presented as developing from fur trade roots through pioneer settlement to a modern, urban, multicultural society. Fur trade sites serve as physical monuments to Canada’s origins in western North America. Even those sites without tangible remains are replete with historic associations of heroic figures, dramatic events and colourful pastimes. They are portals through which the imaginative site visitor can travel back in time as one might visit another country. As such, they have become cultural icons, places to which we attach layers of belief, meaning and significance. In this article we would like to examine these notions of fur trade sites as cultural icons and explore the questions “why were such numbers of these sites selected in the first place?” and “how have they been interpreted over time?”. The answer to the first question is rooted in both the development of Canadian historiography and the evolution of government administered heritage programs. The latter question is closely tied to changing fashions in site development and programming and complex interactions between often conflicting public policy goals ranging from local economic development and community pride to in situ conservation of historic resources and public education. Howay was even more active in championing the national significance of fur trade sites in western Canada, including some that in retrospect seem questionable choices such as Henry House near Jasper, Alberta. This “post” was first mentioned in David Thompson’s account of his travels through Athabasca Pass in 1811 and 1812 to reach his posts in the Columbia River basin. Established by William Henry at Thompson’s behest, it provided some modest support for Thompson’s efforts, but whether it was an operational trading post is subject to debate. Subsequent travellers through the area mention seeing uninhabited structures in the vicinity of the “house” or “camp” Thompson attributes to William Henry, and it is likely that Henry’s “house” was abandoned by 1812 or 1813 when Jasper House was established on Brute Lake. Tyrrell, then, was led to the narratives of Hearne and Thompson from his experience of an historical landscape. 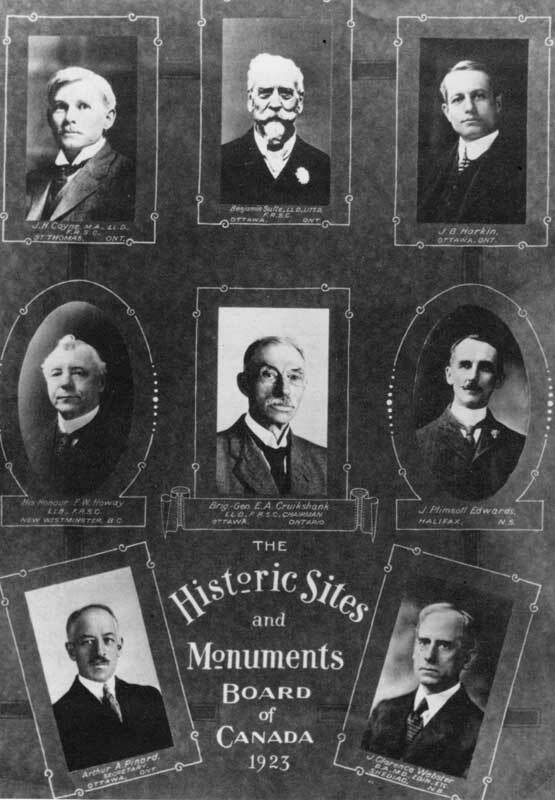 Members of the National Historic Sites and Monuments Board of Canada, 1923. During the Board’s early years, F. W. Howay from British Columbia and James Coyne from Ontario controlled the agenda and priorities for the commemoration of historic sites in Western Canada. 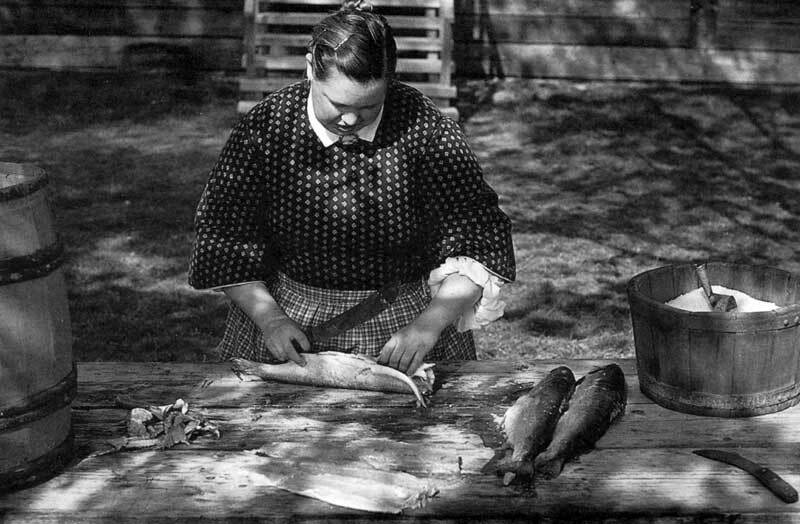 Costumed animator filleting salmon at Fort Langley National Historic Site. The history of the selection of these places as historic sites demonstrates that there are other objectives and forces at work in defining these sites as nationally significant as historic places than simply their relationship to a trade in furs. A significant aspect of commemorated fur trade sites in western Canada is that they have always represented a multiplicity of themes. In addition to their obvious role in representing a broad and often stereotypical narrative of fur trade development,  these early commemorations of fur trade sites in western Canada were used to represent broad themes such as the winning of the West, Canadian territorial expansion, the decline of aboriginal populations and cultures, and the development of settlement and a regional economy based on the production of staple products. This tendency to infuse the fur trade with larger “national” consequences became even stronger when site interpretation expanded beyond simple historic markers. At some major sites such as Lower Fort Garry and Fort Langley these other themes have sometimes overshadowed any direct association with the fur trade as an economic enterprise—perhaps in part because neither site played a particularly central role in the fur trade as a business. Instead both of these sites came to be associated as much with the beginnings of Euro-Canadian settlement in their areas as with the trade in furs, although using fur trade sites to commemorate settlement creates some interesting problems. Many fur trade centres were often either situated well north of early settlement, as at Churchill and York Factory, or if they did coincide with settlements such as at Winnipeg, Edmonton or Victoria, the posts were usually obliterated or severely compromised by subsequent urban development. What Fort Langley and Lower Fort Garry have in common, then, is that both are located near but not within large urban centres. They retained some historic buildings and their location made them easily accessible to visitors, but their centrality to fur trade history is less obvious. As a result, it was the locale of these places rather than their significance to fur trade history that governed the development of programs of first person animation, building restoration and reconstruction, exhibits and interpretive centres at these sites in the 1950s and 1960s. It was in this context that F. W. Howay, a member of the HSMBC and British Columbia’s most prominent historian in the 1920s, proposed Fort Langley as a national historic site. According to Howay, Fort Langley was one of the two most significant historic sites in the province, the other being Nootka Sound where Cook landed. Fort Langley was important to Howay in part because of its associations with the fur trade, partly because of one old building that remained on the site, but mostly because it was from here that the mainland province was called into being by proclamation in 1858 and it was the fort that served very briefly as the mainland colony’s first capital. Fort Langley was presented then as the birthplace of the province. Other fur trade sites in British Columbia with no less intrinsic significance as fur trade sites and better-preserved extant resources were ignored by Howay. For example, Fort St. James represented a much better collection of fur trade era structures than Fort Langley, as well as being an important regional trade centre. Despite these qualities, it was not recognized as a national historic site until 1946, over 20 years after the commemoration of Fort Langley. 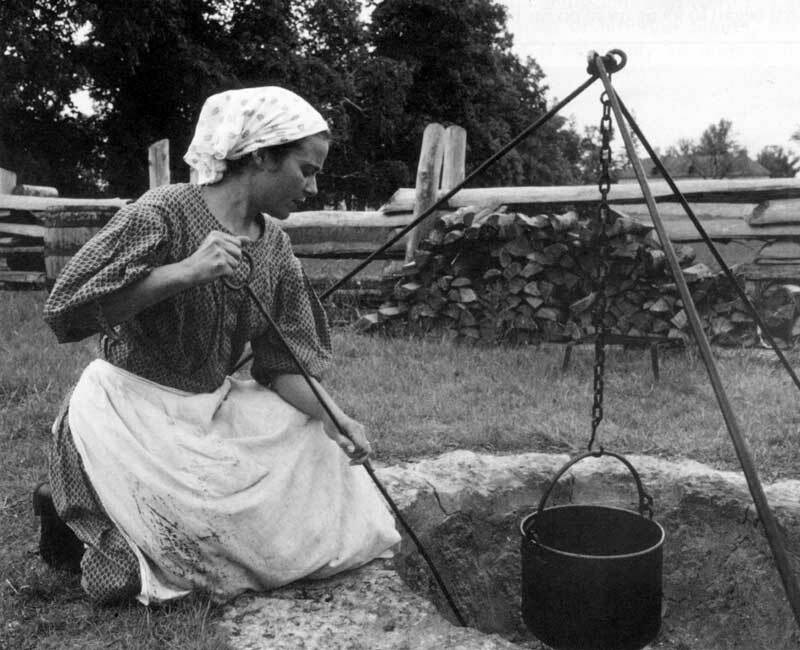 A costumed animator cooks over an open fire at Rocky Mountain House National Historic Site. 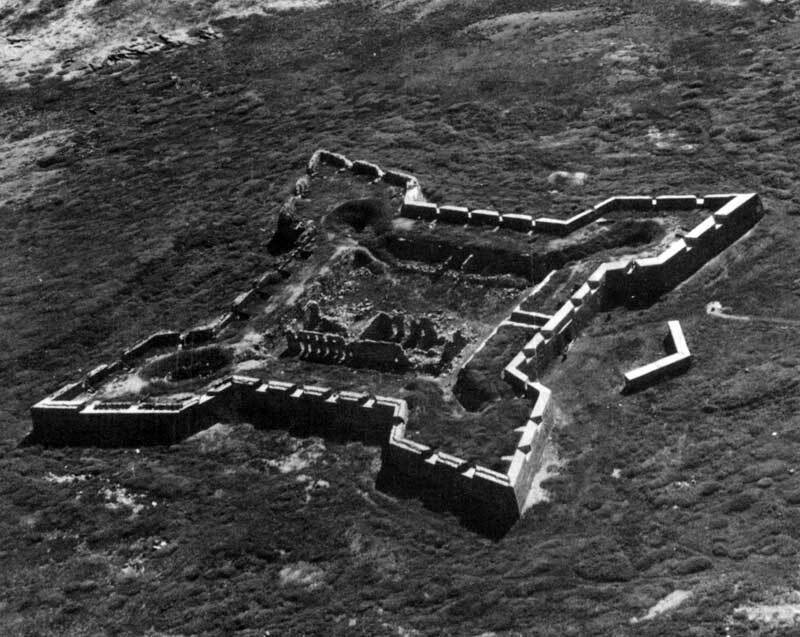 Prince of Wales Fort at the mouth of the Churchill River, 1947. Prince of Wales Fort was the first historic site in the system to involve the protection of ruins as opposed to a commemoration by simple cairn or plaque. Believing strongly in the value and effectiveness of living history museums, the Canadian government in the late 1950s sought, as a matter of policy, to establish at least one of these in each province. The early dominance of fur trade sites in HSMBC designations in western Canada meant fur trade sites also initially dominated the sites selected for development as historic parks in the region as well. The Farm Manager’s Cottage, Ross Cottage and Blacksmith Shop at Lower Fort Garry. Fort Langley was an early candidate for this treatment because of the lobbying of a committee of the Fort Langley Board of Trade formed “to promote the erection of buildings on the site of the old Fort Langley so that the said Fort will be reconstructed as near as possible in the manner in which it appeared in the year 1858.” The intention of this project was to commemorate the upcoming provincial centenary and the provincial government subsequently entered into an agreement with its federal counterpart to implement the committee’s proposal. Although officially opened in 1958, the first phase of reconstruction was not completed until the following year when the Big House, or officers’ quarters, was finished along with part of the palisade. This new construction also incorporated a largely rebuilt sales shop, which is the only “authentic” period structure at the site. During the ensuing decade a blacksmith shop and a generic building interpreted as a cooperage were constructed. The interiors of all these building were all furnished with period replicas and some limited artefacts, while costumed guides gave historical accounts and explanations appropriate to the function of each of the buildings. things have come to evoke and represent the past to modem visitors, and they tend to confirm rather than challenge conventional perceptions of life in earlier times. Also typical of pioneer villages, these sites were—and in most cases still are—clean, tidy, and inhabited largely by polite young men and women. In part this is deliberate, as both places consciously strive to interpret the birth of their respective provinces, in part it is accidental, a by-product of interpretive programs that rely on summertime student labour. Although Fort Langley and Lower Fort Garry strove to present period animation, with costumed interpreters assuming the roles of historical figures, the objectives of running what is essentially an outdoor museum could sometimes constrain or even conflict with those of living history. For example, site buildings were and are carefully furnished with replica or even authentic antiques. If the visitors are to be allowed to tour the interiors of one of these restored buildings in a natural way—that is without seeing museum type barriers then site staff have to be stationed to ensure that one of the visitors does not literally make off with the silverware. Since the numbers of guides are usually limited and the numbers of restored buildings are many, this often means that a single costumed guide is stationed in each building with little opportunity to interact with other characters in a natural way. It can also mean that some rooms or buildings are closed on occasion or that exhibit cases or roped off areas have to be introduced in some rooms. This is not an insuperable problem and most site visitors are quite used to the idea of having limited access to rooms and artefacts, but solitary guides interacting with visitors rather than other historical characters while keeping a careful eye on the “stage props” is a far cry from the stated goals of “first person” animation. Following Parks Canada’s lead, the late 1960s and early 1970s were also marked by an upsurge of interest in museum and historic site development on the part of municipal and provincial heritage agencies. Canada’s Centennial in 1967, Manitoba’s Centennial in 1970, and the 75th anniversary celebrations in Alberta and Saskatchewan in 1980 prompted much of this activity. Alberta, in particular, embarked upon an ambitious program of developing museums and historic sites after 1980 that led to the opening of Fort George and Buckingham House, Victoria Settlement, and Dunvegan as interpreted fur trade sites in the 1980s and early 1990s to complement the sites operated by Parks Canada. 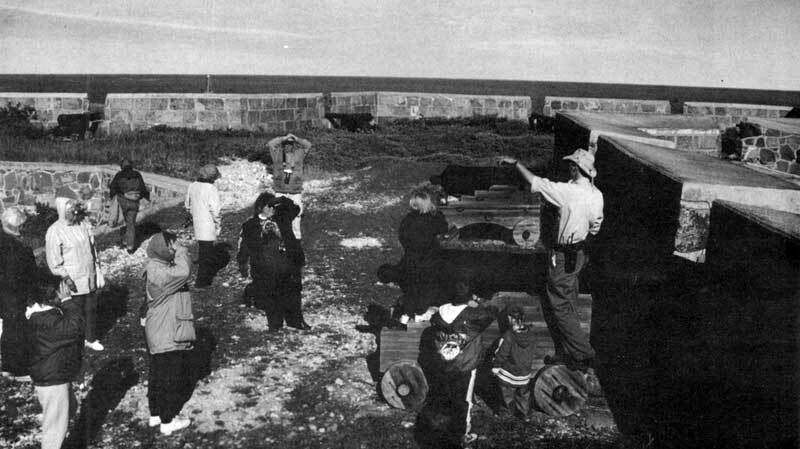 Interpreting the history of Prince of Wales Fort at Churchill, 1992. A costumed animator at the Farm Manager’s Cottage at Lower Fort Garry National Historic Site, 1985. What is worrisome is a sense that heritage agencies may be encouraged to feel casting a few Aboriginal wives and trappers in animation programs and installing some interpretative panels that discuss native involvement in the fur trade has somehow covered “Aboriginal history.” Encouraging visitors to observe native cultures and experiences primarily through the prism of the fur trade ignores most of the richness and diversity of those cultures and experiences. It also may mean that heritage agencies will not put the kind of effort into identifying, protecting and interpreting Aboriginal sites other than those associated with the fur trade that they probably should. A constraint felt by many interpreters at historic sites is the consciousness that they are contributing to a heritage attraction, that their role is to entertain as much as to educate. Sites developed as attractions are going to be wary about telling too many depressing stories. They want to be fun. And by the same token they are disinclined to provide explanations that seem difficult to all but professional historians. The idea of ‘multiple voices’ that history can include various conflicting points of view, while attractive to public historians, is extremely challenging to implement in an entertaining manner that is understandable to the public. It is often suggested that the “past is a foreign country,” and not surprisingly heritage agencies have little desire to make their visitor/history tourists uncomfortable in those foreign lands, especially if those visitors have to come up with an admission fee for the privilege. Places selected to commemorate the fur trade in western Canada are a prime example of how historic sites can function as cultural “icons.” As icons, they have always been used to represent far more than just the industry, individuals or events that brought them into existence. They provide physical and graphic depictions of our past and are particularly powerful because they seem “real.”  When early fur trade sites were used to portray the fur trade as a link in the great Canadian chain of being (the colony to nation model of Canadian historiography), or suggest some crude version of a Canadian “Manifest Destiny,” this was as significant as the sites themselves. In recent years, using these sites to provide better “coverage” of Aboriginal, women’s, multicultural and environmental history is no less significant. As a result any close examination of historic sites tells us almost as much about ourselves as the past they seek to preserve and interpret. They too are cultural artefacts like the exhibitry they house and interpret, and as such they reflect their own institutional history and the policies and politics that shaped their selection and development. 1. The impact of historic sites on popular perceptions of Canadian history is worth study in its own right. Visitation figures and visitor surveys conducted by heritage organizations suggest that sites reach a large public audience and that these sites are very effective both in convincing visitors that they have learned something and that they enjoyed their visit. Alberta Community Development, for example, has been conducting visitor surveys at its historic sites, museums and interpretive centers for several years. The most recent survey figures for 2002 indicate that overall a healthy 97.7% of visitors surveyed rated their satisfaction with their visit as “good” or “excellent” and 89% indicated that the knowledge they gained about Alberta’s history from their visit was “good” or “excellent”. See Infact Research and Consulting, “Heritage Facilities Visitor Survey 2002 Tabulations I: 1931 I Division Total, Historic Sites Service Totals and Site Totals” (Edmonton: Cultural Facilities & Historical Resources Division, Alberta Community Development, December 2002) esp. p. 32. Many fur trade historic sites attract limited numbers of visitors because of their remote locations, York Factory for example, but Fort Edmonton Parkand Old Fort William both attract 100,000 visitors or more a year according to site materials. The most easily accessible visitor figures for national historic sites in print and on the Internet (http://www.parkscanada.gc.ca/docs/pc/rpts/etat-state/state-etatLe.asp) can be found in “State of the Parks 1997 Report.” According to the figures listed in this report in Appendix 7: Parks Canada Attendance, Lower Fort Garry and Fort Langley attracted an average of over 60,000 and 70,000 visitors respectively from 1993 to 1997. There are also many smaller fur trade sites across western Canada that consistently attract between 5,000 and 25,000 visitors a year. 2. Some sense of the number and variety of these sites can be gained by consulting Barbara Huck, Exploring the Fur Trade Routes of North America: Discover the Highways that Opened a Continent (Winnipeg: Heartland, 2002). Although very thorough, the list of sites mentioned in this book is not comprehensive, particularly in the area of locally designated and commemorated sites. 3. The early history of the Historic Sites and Monuments Board of Canada is summarized in C. J. Taylor, Negotiating the Past: The Making of Canada’s National Historic Parks and Sites (Montreal and Kingston: McGill-Queen’s University Press, 1990) esp. pp. 32-60. 4. The plaque for Methye Portage was located at Fort McMurray in Alberta, although the actual portage is located in Saskatchewan. In the years prior to 1950, sites with fur trade associations dominated Historic Sites and Monuments Board of Canada (HSMBC) commemorations in Manitoba and Alberta, and were a major component of commemorations in Saskatchewan and British Columbia. In total the HSMBC made 79 designations in these provinces and in the Yukon prior to 1950—of this number 34 or slightly under half of all designations were of fur trade posts, events in the fur trade, or individuals active in the fur trade. The dominance of fur trade designations in Manitoba and Alberta is particularly striking in the pre-1950 period. See Ibid., 61-90 and Appendix One to this paper. Since 1950, the HSMBC has not abandoned designating fur trade related sites, individuals or events, although these designations are less common. Provincial and local commemorations, however, have taken up some of the slack. In Alberta, for example, the City of Edmonton made reconstruction of Fort Edmonton a centrepiece of its heritage program, and the province of Alberta operates Dunvegan, Fort George and Buckingham House, and Victoria Settlement as interpreted sites with a fur trade focus. 5. Harold A. Innis, The Fur Trade in Canada: An Introduction to Canadian Economic History, (Toronto: University of Toronto Press, 1970) 393. 6. Taylor, Negotiating the Past, 51. 7. National Archives of Canada: RG 84, series A-2-a, vol. 1374, microfilm reel T-14143, file “Historic Sites Western Canada” part 1, 1916-1920, James H. Coyne to Ernest A. Cruikshank, Chilliwack, 24 September 1920. 8. See Parks Canada, Record of National Historic Site Designation, Reference File for Henry House, 1931. 9. The choice of site suggests the Board was basing its assessment of the general location of Henry House on David Thompson’s survey readings. 10. The original plaque text refers to Henry House as operating for about twenty years as an “important point” in the Athabasca Pass transportation system: “Here began the difficult land passage across the Rocky Mountains.” In his remarks at the unveiling, as reported in a newspaper clipping, Howay described Henry House as a small post, but one that played “a gigantic part in the development of Canada’s transportation system. It was one of the main supports of the first line of transportation, the fur brigades, since replaced by the transcontinental line of the Canadian national railways, which follows the same route up the valley.” Parks Canada, Calgary Regional Record Centre, file C8400/548, “Henry House, Jasper National Park.” Howay’s interest in Henry House may also be tied to a certain tendency by Board members “to emphasize the history of their own neighbourhoods,” as C. J. Taylor has put it. Howay was very interested in commemorating sites and events that related to British Columbia’s place in Canadian history. Although located in Alberta, Henry House’s presumed significance was based on its role in integrating parts of what would become British Columbia into a transcontinental fur trade system. This reflects a common view in Innis and other early fur trade historians that Canada’s political boundaries were shaped by the fur trade. See C. J. Taylor, Negotiating the Past, pp. 88. 12. J. B. Tyrrell (ed. ), David Thompson’s Narrative of His Explorations in Western America, (Toronto: Champlain Society, 1916), xviii-xix. 14. It is possible to visit the site of the second Jasper House, although it is located in a part of the park few visit. The original site of Jasper House has never been positively identified so visiting it is out of the question. At the time the Jasper House plaque was first placed, surviving correspondence clearly indicates that staff chose the location to ensure maximum visibility. See National Historic Parks and Sites—General, Jasper House, Jasper, Alberta HS10-20, July 1927-August 1985, file number C8400 /580. Memorandum for File E.1, J.M. Wardle, Chief Engineer, National Parks of Canada, Banff, Alberta, 16 August, 1927. In addition to Harkin, Mitchell and Wardle, the Deputy Minister of Public Works and other departmental officials were present when the new site was chosen. 15. Unlike parts of central Canada and the. Maritimes, western and northern Canada had relatively few surviving structures that predated even 1900. There were of course Aboriginal archaeological sites of great antiquity, but the board rarely designated “prehistoric” sites prior to the 1960s when the National Parks Branch began to hire archaeologists as regular staff. See Taylor, Negotiating the Past, 184. 16. Taylor, Negotiating the Past, 59. In Canada, national designation carries no legal protection of a site except for those owned operated by the government or subject to federal legislation, such as railway stations and federal buildings. Fortunately Prince of Wales’ Fort was on federal land. Over time preservation programs have become an increasingly important aspect of the work of heritage agencies, although in most cases these programs are based on provincial or municipal legislation and bylaws. In a sense, Prince of Wales’ Fort foreshadows the growing importance of preservation programs within the historic site movement in Canada after the 1960s. 17. Some of the themes no site can seemingly ignore include some or all of the following: the fur trade as imperial rivalry; the fur trade as motive for exploration; the fur trade as competition between rival companies/corporate philosophies/ transportation routes and technologies; the fur trade as precursor to Euro-Canadian settlement, and the decline and presumed fall of the fur trade as part of the “modernization” of Canada. The fur trade may also join business and political history as the last refuge of “great man” explanations of history. The tendency to either blame or credit George Simpson for virtually everything that happened in the fur trade from 1821 to 1860 is perhaps the most extreme manifestation of this tendency. 18. Lower Fort Garry was always a relatively small post with limited operations, especially in comparison with the much larger Upper Fort Garry, which was the real fur trade center in the Red River Settlement. The claims for Fort Langley are better as it did act as a depot and administrative center for the Hudson’s Bay Company’s operations on the Pacific coast. In the late 1820s and 30s it produced a fair volume of furs. Returns of beaver peaked in 1833 at just over 2800 pelts, but average returns were much lower and were frequently less than 1000 pelts. This volume of trade would be appreciably less than the average number of beaver pelts produced at a post such as Dunvegan during the same period. Put another way, Fort Langley’s production of beaver peltsin 1827/28 was 1129 while tiny Jasper House produced 899. In later years, Fort Langley emerged as a significant supplier of salmon and agricultural products for the fur trade, but once again this was important but hardly a nationally significant contribution to trade operations. Fur returns for Fort Langley are summarized in Mary Cullen, The History of Fort Langley, 1827-1896 (Ottawa: National Historic Parks and Sites, 1979) Occasional Paper #20. 19. The use of a “historic site”—albeit a created one—to forge an association between a fur trade post and subsequent urban development is perhaps most clear with Fort Edmonton Park, which incorporates both a reconstructed fur trade post and an ever-growing collection of historic buildings organized to depict Edmonton’s history at specific periods (1885, 1905 and 1920). The reconstructed post is clearly the centrepiece of the heritage park development, and it is physically placed in close association with much later structures in a kind of telescoping of historical chronology that meets interpretive programming goals but is clearly anachronistic. A good overview of the park development, including a map showing the physical layout of the park, can be found at www.gov.edmonton.ab.ca/coinm_services/city_op_attractions/fort. 20. 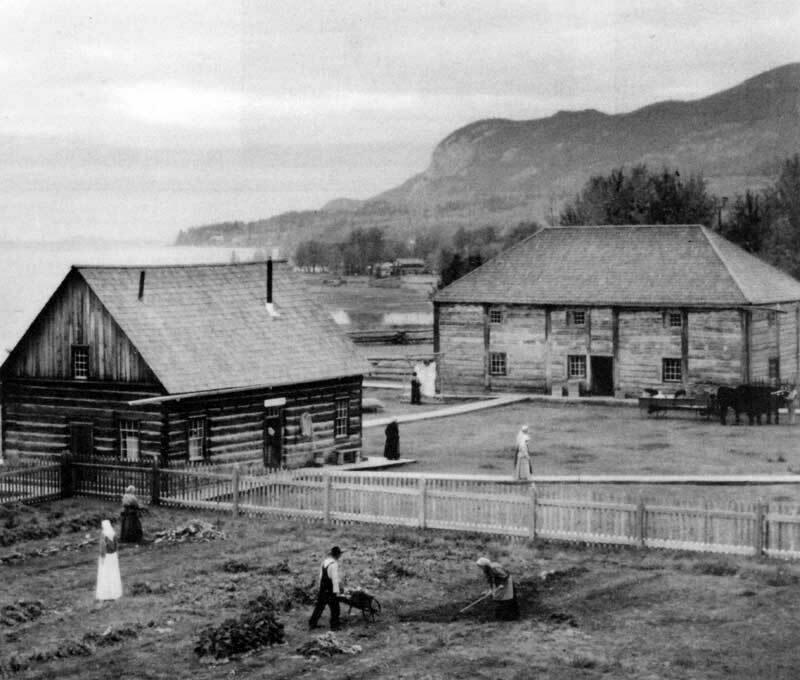 The small settlements that grew up around places such as Upper Fort Garry and Fort Edmonton did eventually grow into urban centers, but at Rocky Mountain House, Jasper House and many other sites there was a significant gap of years between the closing of the fur trade post and the beginnings of significant new settlement. Interestingly, in several instances where there were only limited archaeological remains of sites as in the case of Edmonton and Thunder Bay, posts have been reconstructed in new locations to stand for the now vanished post that was the presumed foundation of the city. 21. Ibid., 109 and 146. 22. The process of shifting the emphasis of interpretation at Lower Fort Garry from Treaty 1 to the fur trade was clearly driven by the desire to use Lower Fort Garry as a setting for a sophisticated “first person” animation program using costumed guides playing the role of real historical personages associated with the site. A single event such as the signing of a treaty, while almost certainly more nationally significant than the post’s limited role as a fur trade site, had limited potential as a basis for site programming. 23. One of the best expositions of the theory and practise of “living history” may be found in Jay Anderson, Time Machines: The World of Living History, (Nashville, The American Association for State and Local History, 1984). “First” person animation has long been treated as the pinnacle of interpretive programming. It is costly in every sense of the term from labour costs to the complexity and scope of the historical and curatorial research needed to support such programming. As a result, many sites have in recent years moved to the less demanding style of “third” person animation - costumed guides who do not attempt to portray actual historical characters and who can switch roles from tour guide in period dress to historical character as circumstances and visitor questions require. That said, first person animation programs can be extraordinarily effective in imparting information. That some of this information may be misleading or very debateable is a separate issue. 24. Taylor, Negotiating the Past, 145-46. The history of the development of Fort Langley is also studied in considerable detail in Jamie Morton, Fort Langley: A Site History 1886-1986, (Ottawa: Environment Canada, Canadian Parks Service, 1986) Microfiche Report Series #329. 25. A study of the development of Lower Fort Garry as an historic site has been written by Robert Coutts, An Operational History of Lower Fort Garry 1911-1992, (Ottawa: Environment Canada, Canadian Parks Service, 1993). The various Manuscript and Microfiche Reports, Occasional Papers and Research Bulletins published by the Canadian Parks Service on Lower Fort Garry give some sense of the evolution of this site. One might, for example, compare George Ingram’s structural histories or Dale Miquelon’s history of the “Big House” with more recent studies by Carol Livermore or Robert Coutts. See also Graham Macdonald, A Good Solid Comfortable Establishment: An Illustrated History of Lower Fort Garry (Winnipeg: Watson & Dwyer, 1992). 26. Rocky Mountain House created a different set of presentation issues from Lower Fort Garry and Fort Langley. It is primarily an archaeological site that incorporates the original 1799 Hudson’s Bay Company post (Acton House), a 1799 North West Company post (Rocky Mountain House), and several versions of the Hudson’s Bay Company’s Rocky Mountain House occupied between 1821 and 1875. The site also includes a cemetery, Aboriginal campsites and other archaeological remains, including other possible posts. In addition to this confusing sequence of post locations, the current historic site has added a replica fort, a Visitor Reception Centre, self-guided trails, a buffalo paddock and other interpretive resources. 27. Taylor, Negotiating the Past, 188. 28. It is interesting to note that most of these sites were developed based on much earlier designations that had consisted only of historic plaques. There are relatively few major historic parks acquired and developed since the mid-1960s specifically because they lend themselves to interpretive programming. In many cases, these new more elaborate historic parks were based on previous designations—many dating back decades—or they are based on reconstructions or relocated historic buildings. 29. New provincial museums were created in Manitoba, Saskatchewan and Alberta in this period. 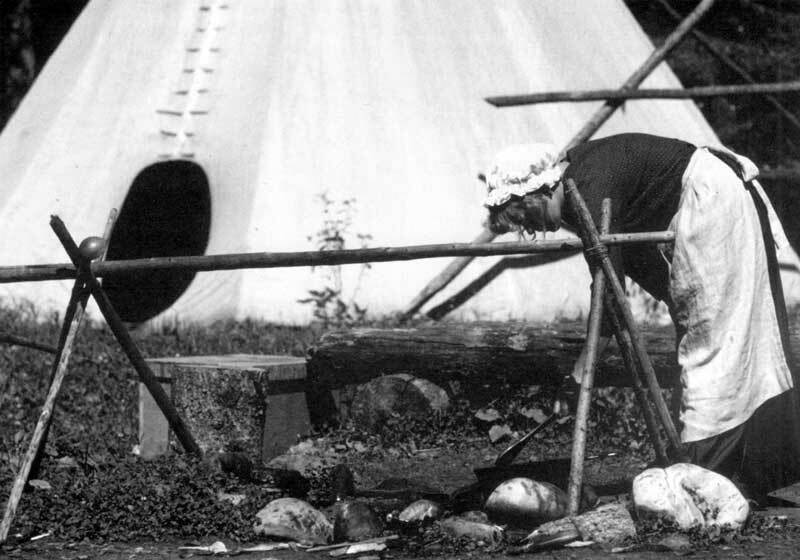 Fort Edmonton Park was begun, and Eric Harvey’s donation that forms the basis of the Glenbow Museum and Archives dates from 1966. Many smaller community museums and historic sites also date from this very significant period for Canada’s heritage movement. 30. For a recent summary of changing trends in fur trade historiography see Michael Payne, “Fur Trade Historiography Past Conditions, Present Circumstances and a Hint of Future Prospects” in Theodore Binnema, Gerhard Ens and R. C. MacLeod (eds. ), From Rupert’s Land to Canada (Edmonton: University of Alberta Press, 20010 pp. 3-22. 31. Without belabouring the point, many Aboriginal communities prefer that sites of deep spiritual and community significance are not turned into tourist attractions. Similarly most archaeological heritage programs like to keep exact locations of sites secret to discourage vandalism, pot-hunting, and even use by well-mearting non-Aboriginal individuals. Of course many sites are open to the public and there are guidebooks aimed at audiences interested in visiting certain specific sites. Few of these, aside from sites such as Writing-on-Stone Provincial Park, Head-Smashed-In Buffalo Jump, and Wanuskewin, rival the large interpreted fur trade sites in terms of development and programming. A good example of a guidebook to publicly accessible archaeological sites is Barbara Huck and Doug Whiteway, In Search of Ancient Alberta (Winnipeg: Heartland Publications, 1998). 32. Kenneth Coates and Robin Fisher, Out of the Background: Readings on Canadian Native History (Toronto: Copp Clark Pitman, 1988). 33. Lower Fort Garry actually had a bakehouse and several ovens, which were used to produce bread for post consumption and biscuit for use on the brigades and at other posts. Most of this bread and biscuit was produced by the post cook and baker, both of whom were male employees of the company. See Gregory Thomas, The North West Bastion Bakehouse, Lower Fort Garry: A Structural and Furnishing Study (Ottawa: Canadian Parks Service, Environment Canada, 1979) Manuscript Report Series #297, and Michael Payne, “Labour at Lower Fort Garry: An Animation History”, unpublished report on file, Canadian Parks Service Prairie and Northern Region Office, 1990. For what women actually worked at and who they were at Lower Fort Garry, see Michael Payne, “The Role of Women at Lower Fort Garry, 1840 to 1860: An Animation History”, unpublished report on file, Canadian Parks Service, Prairie and Northern Region Office, 1990. 34. See Sylvia Van Kirk, “Many Tender Ties”: Women in Fur Trade Society, 1670-1870 (Winnipeg: Watson & Dwyer, 1980). Echoing British historian Peter Laslett, Van Kirk uses this phrase as the title for the concluding chapter of her book. 35. Jennifer Brown, “Fur Trade History as Text and Drama” in Patricia A. McCormack and Geoffrey Ironside (eds. ), The Uncovered Past: Roots of Northern Alberta Societies (Edmonton: Circumpolar Institute, University of Alberta, 1993) p. 86. 36. Ibid. Although intended as a discussion of popular presentations of the fur trade in written form, many of the points made by this article also can be applied to presentations of the fur trade at historic sites. It should probably be required reading for all site guides and managers and anyone working on exhibits or site publications. 37. Sarah Carter, Aboriginal People and Colonizers of Western Canada to 1900 (Toronto: University of Toronto Press, 1999) p. 10. 38. For example, the latest promotional campaign for museums and historic sites in Alberta was based on the idea that they represent “real history.” What this suggests about all other types of historical presentation is intriguing. 39. NAC, RG 84, vol. 911, file HS 2.